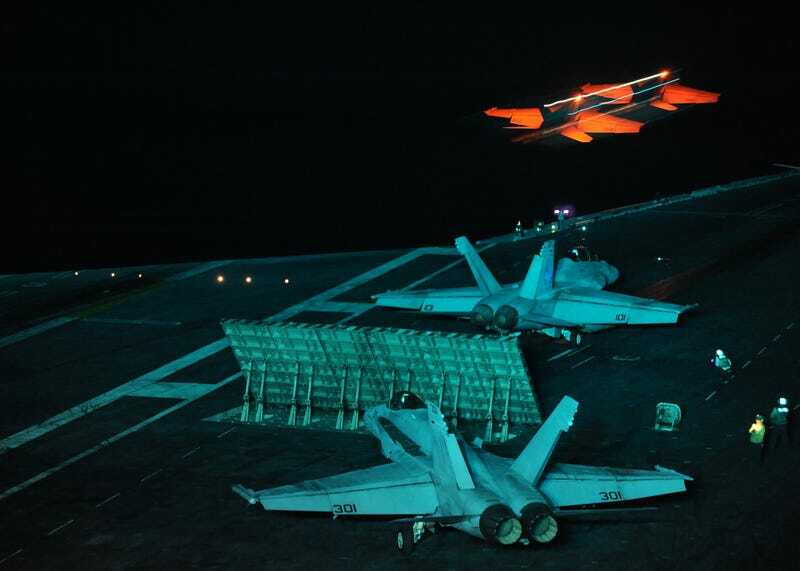 Watching F/A-18E fighters launching from the deck of the USS Abraham Lincoln—a Nimitz-class aircraft carrier part of the US 5th Fleet—is always impressive. Watching them catapulted into the nothingness of night makes it beautiful, and a tad scary. The birds above are assigned to the Kestrels of Strike Fighter Squadron (VFA) 137, part of the Abraham Lincoln Carrier Strike Group. This one—part of the Argonauts of Strike Fighter Squadron (VFA) 147—is getting onto the catapult on board the supercarrier USS Ronald Reagan.